The Olympics have long been a hotbed of broadcast technology. Both colour TV (1964) and HD (1984) made technical previews at the games. NHK, the Japanese broadcaster, was behind both of those advances and it has now teamed up with the BBC's Research and Development department and OBS (Olympic Broadcasting Services) to preview the next generation of hot broadcast tech. Known as UHDTV, Ultra High Definition gives a stunning image that's 16 times the quality of HD. That's an 8K resolution or 7,680 x 4,320 pixels. NHK has given the technology a brand name: Super Hi-Vision, presumably so it can market the technology in the future. But this isn't just an endeavour in image quality; NHK has also developed stunning 22.2 sound to go alongside it, which sounds simply epic. We popped along to the BBC's revamped Broadcasting House last Monday to get a glimpse of Super Hi-Vision in action on an 8 metre-wide cinema screen installed in the BBC Radio Theatre. We were shown a 25 minute edit of the opening ceremony first, followed by a slice of live swimming from the Aquatics Centre. The first thing to say is that the images look incredible, but there's a rather more complex story behind this high quality endeavour. Before we went to the Radio Theatre, we met up with John Zubrzycki from BBC R&D, as well as Super Hi-Vision Project Lead Tim Plyming, at BBC Television Centre's TC0, a research studio. There we viewed the Super Hi-Vision edit suite and sound processing equipment as well as viewing some footage on an 85-inch Panasonic plasma TV. "We think you'll agree, many people have said it's like being there," said Plyming, who added that the corporation had "completely stripped Japan and NHK of being able to do Super Hi-Vision at the moment, all the equipment is here." When questioned about the length of time Super Hi-Vision would take to come to market, Plyming is realistic. "HD was first used in 1984 in Los Angeles, so it's taken more than 20 years for that to come to mass market [at London 2012]." The BBC has also worked with BT and Janet UK, the education network, to provide the bandwidth to send Super Hi-Vision between the Olympic Park, Television Centre and Broadcasting House as well as to other broadcast centres in Glasgow and Bradford (the BBC has given out tickets for the public to preview the technology at those sites and in London during the Olympics). "We're using Janet's 20GBps connection to send these pictures around the UK and to our viewing theatres [in Japan and the US]." The kit all arrived into a stripped out TC0 in mid-July from Tokyo and was put together the week before the Olympic opening ceremony. 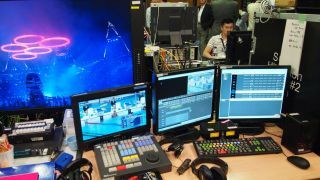 The production has been running for 24 hours a day throughout the Olympics. There's a video and audio truck lodged at the Olympic park to process the sound and vision. This is then sent, via the Olympic International Broadcast Centre (also at the park), to the production studio at BBC Television Centre where video and sound are edited. BBC Principal Technologist John Zubrzycki takes up the story to tell us about some of the technical aspects of the technology. "The connection from the Outside Broadcast vehicles to the SHV Production Centre is via an optical fibre link carrying the SHV uncompressed at 24 Gbit/s over eight wavelengths. For security, there is a backup fibre link taking a different route across London." "The signals come in on optical fibre, they can be played out live or recorded here. NHK have taken the pragmatic approach to Super Hi-Vision by saying 'it's 16 times the pixel count of HD, let's use 16 HD recorders to record it'. And here's the bank of recorders." "You'll find this [pattern] repeated throughout. When they're wanting to edit, they have two edit stations here. They have an edit station for the UK feed and another for the Japanese feed. The editors are prototype editors so they don't have all the bells and whistles of an HD editor. They tend to edit HD first for a rough cut, to get an edit list they can then use for the Super Hi-Vision. "For the opening ceremony we started at 1am after the ceremony finished." Editing happens overnight, but progress is slow due to the immense amount of data involved. There are only three Super Hi-Vision cameras in existence and all were used inside the Olympic stadium for the opening ceremony and then for various events after. What's most interesting about the footage is that, because of the limited angles available, you get much more of an overview of the action. While the standard HD footage flipped between various angles of the Olympic flame, the Super Hi-Vision pictures simply show a bird's eye view, with the petals of the torch slowly drifting skyward. It was very satisfying for the opening ceremony (and effective) but for the swimming it was a bit annoying not to have the amount of coverage afforded by tens of cameras. Certainly when we were watching the opening ceremony highlights it felt like we were right in on the action – we could have been at the stadium itself to use the cliché. We weren't, obviously, but the fact remains that it was awesome, though we felt the images looked a whole heap better on the 85-inch Panasonic plasma rather than the 8 metre screen. On both screens we could make out even relatively small people in the opening ceremony action and see pieces of scenery being changed when on an HD picture your eye simply wouldn't be drawn to this level of detail because it just wouldn't be clear enough. This might seem an obvious thing to say, but when it's claimed you can be so absorbed by the action you could feel like you're there, it's a point worth making. It's also tough to say how much the experience is boosted by the sound. It's like the very best cinema, only sound is genuinely coming at you from every angle. Applause was a particularly striking thing – during the swimming you thought somebody next to you was clapping, but it was somebody in the Aquatic Centre. As a proof of concept, it has to be said that what we saw was a resounding success. And, while your hard-nosed TechRadar writer felt some emotion while seeing those five rings come together and spark when viewed live, it was a different matter when viewed, recorded, in UHDTV - it brought a huge lump to our throat. Given the rapid advance of tech these days, It will be mightily interesting whether it really will take UHDTV until the Olympics in 2032 to be mainstream – perhaps we'll all be seeing Super Hi-Vision a bit sooner than that?